If you cast your mind back to when the PS3 still had its original software, it’s incredible to think how much it has changed, simply with firmware upgrades. While cross game chat will probably never come to the console (unless you put our podcast on it), the features under the hood have expanded greatly, making the device truly future proof. And if you’re a fan of having your PS3 improve, then we have some good news: a new firmware update is on the horizon. Firmware version 3.70 will bring a whole host of new features – especially if you’re a PlayStation Plus subscriber. If you’re paying the monthly/yearly subscription, Sony will give you the option to automate two existing features. To show these features, the [Automatic Download] feature will be renamed [Automatic Update]. 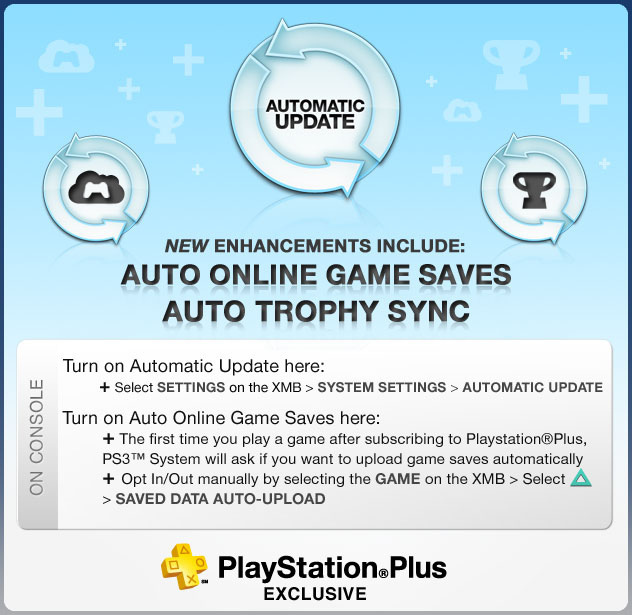 Trophies will now sync automatically at the timing of Auto Download. A new recommendation function will also be added that enables you to share your recommendations for PlayStation Store items, such as games and videos, with your friends on PSN. If you really want to sell something for Sony show someone an interesting game, you will be able to send messages with a store link to friends from the product pages within the PlayStation Store. The update will come “soon”, along with a “minor” PSP update that will be version 6.60.